Swan Hill Memorial Park was established in 1860. It is located on the corner of Coronation Avenue and Wattie Street, on the south end of Swan Hill. We like to think of our lovely parkland as not only place of mourning but a place to reflect and find peace. Access is available to the public 24 hours a day, seven days a week. Office staff are generally onsite on Fridays between 9am and 2pm. Other times can be arranged by appointment. Swan Hill Memorial Park was surveyed and commissioned in the 1850’s. The surveyor was Mr Robert McPherson who ironically became the cemetery’s first internment in 1859 with the first trustees not appointed until July 1860. 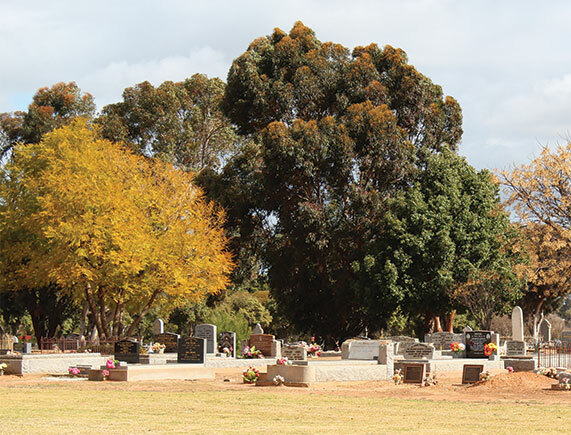 Up until this time, the village of Swan Hill had no official cemetery, although it is believed that an unofficial site was located north of the Swan Hill City Bowling greens, north east corner of Curlewis and Pritchard Streets. In the early days the trustees were representatives of the various religious bodies in the district. The first trustees were Duncan Campbell (Presbyterian), Robert Taylor (Presbyterian), Samuel Watson (Church of England), and Benjamin Gummow (Church of England). They had a struggle to eventually find representatives from the Catholics and the Wesleyan’s. On November 18, 1886 a destructive grass fire ripped through the Cemetery taking all it’s records with it. Even tombstones, constructed of wood were destroyed, leaving the modern secretaries often struggling for information on the past burials of the early days of the cemetery. 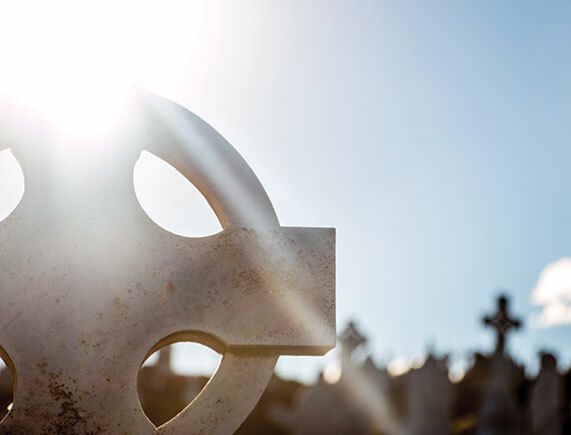 The cemetery has had many sextons and trust members come and go over the years. Most often giving their own flavour to the current records. In the early days the Sexton was in charge of everything from record keeping to digging the graves. It was a lowly job, and one often given to someone who was physically strong but not necessarily adapt at record keeping. Today we are thankful for modern day record keeping and the grave digging machinery available. It certainly makes the job a lot easier. 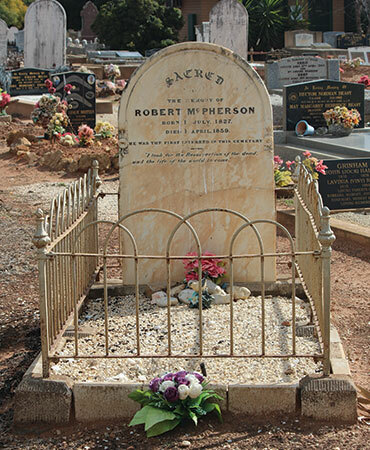 Robert McPherson was the first burial to take place in our cemetery on April 3rd, 1859. His memorial stands in what is now known as our Non-Denominational section, although he was buried as a Presbyterian. He was the first Clerk of Petty Sessions (now known as a Magistrates Court) in Swan Hill and was responsible for surveying the land that Cemetery now stands on. He died at the age of 31 from tuberculosis, leaving behind a pregnant wife, whom he’d married only 7 months earlier. We have much to thank Robert for. There are hundreds of unmarked and unknown graves within Swan Hill Memorial Park, and that of Harry Power is one of them. Harry Power was an Irish convict, sentenced to life in Australia for stealing a pair of shoes. 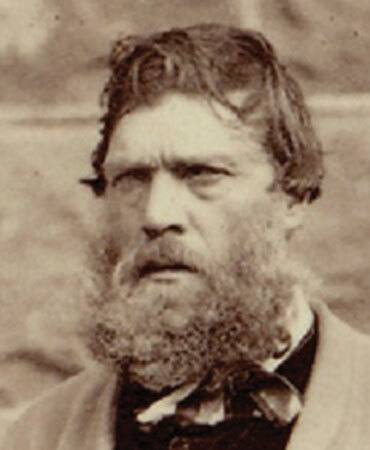 He then spent much of his life in prison, and had links to Ned Kelly, the Kelly Gang and other notorious bushrangers. With a large bounty for his capture in 1870, he made a hideout in the King Valley near Whitford in Victoria, a place that is now known as “Power’s Lookout”. And although he never killed any of his victims, nor robbed from the poor, it was documented he had an extremely violent temper. Found dead in the Murray River near Swan Hill on 11th October 1891, he was buried as a “pauper” in the Swan Hill Cemetery. No marker, no headstone, and therefore no known whereabouts. Possibly just as Harry Power would like it. Queen Aggie was one of the most respected aboriginal ladies of her time, with her stylish but simple manner, she left a lasting impact on all those who met her. 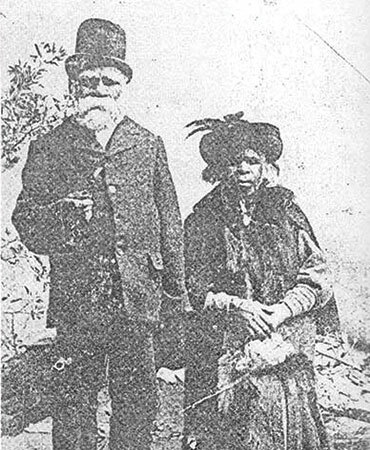 She was born into the Wati Wati tribe and later married Harry Edwards. As an aboriginal craftworker she was known to make magnificent flower arrangements from the feathers of native birds, as well as grass mats and other useful household items. She earned her living by selling her craftwork in Swan Hill. Her brush with royalty occurred when she presented the governor Lord Hopetoun’s wife with an elaborate creation when they visited Swan Hill in 1897, and it was after this time she became known as “Queen Aggie”. Some of Queen Aggie’s work can now be found in our National Museum. Aggie’s monument was erected by the Swan Hill Branch of the ANA (Australian Natives Association) and she can be found beside the Public Section of our Cemetery. 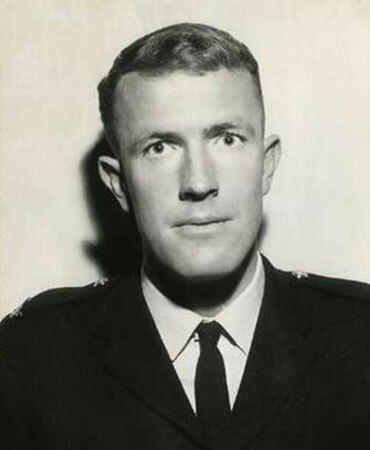 Senior Detective Lane was killed on duty at Kyalite on 13th July 1979 after investigating the use of false number plates and possible car thefts. He left behind a wife and 2 daughters, and a community in shellshock. He is buried in our Lawn A section within the Cemetery. Bob, or Rocky as he was affectionately known, was a brilliant footballer in his time having played for Carlton, and then going on to coach both the Lalbert and Lake Boga football teams in the now Central Murray Football League. The Bob Lane Cup is fiercely played between the two teams every year in memory of Bob. He was said to have changed the style of football in the district. Bob is also recognised within our local hospital at “The Robert Lane Resuscitation Unit”. This was a commitment from the Blue Ribbon Foundation in honour of Bob, for new equipment to be installed in the hospital’s emergency department. Looking for park policies, resources & information?